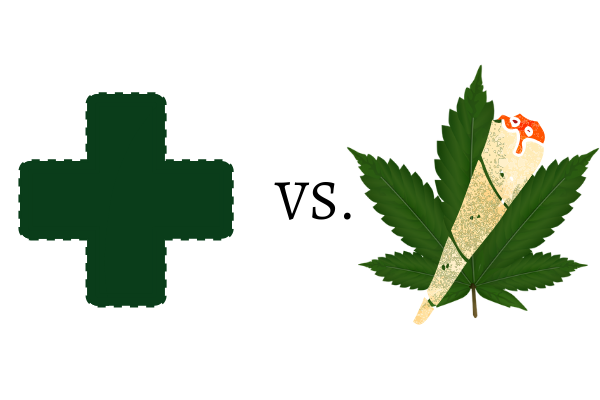 There’s a great debate on which will be the winner when it comes to recreational cannabis versus medicinal cannabis sales. Both sides present strong arguments as to which will be the victor. When you look at current statistics related to the cannabis industry you have to remember this market is a new one that has yet to stabilize. Numbers fluctuate up and down. Predictions are based upon things said to happen rather than solid events that have already occurred in many cases. Access to cannabis products is a major factor. Look at States like Arkansas where medical cannabis has been legal for some time. Even though legalization was passed not a single dollar has been made from the sale of medical cannabis because of bureaucratical nonsense. Plain and simple no dispensaries are open so no sales can be made because regulators bicker back and forth. This puts a dampening effect on what could have been a strong start to a solid financial foundation for the industry in the state. CBD is growing in popularity and many people are starting to become more interested in this phytocannabinoid. THC is largely responsible for the intoxicating effects or buzz from cannabis. When you take away the THC consumers report receiving all the benefits from weed minus the cloudy mind. In the United Kingdom, high CBD varieties of cannabis are a huge hit! This type of weed is referred to as marijuana lite. Marijuana lite contains an average of 1% THC or less and 15% CBD or more. The CBD industry globally is on fire! Consumers can’t get enough and farms from China and Canada to the United States and everywhere in between are starting to grow the green. When it comes to the recreational cannabis market there is no doubt that people still love it. People will look for a way to relax and that’s a fact. But, is cannabis recreational? If you consume something that benefits you medicinally how can it be recreational? When someone reaches for a joint instead of a beer or pill they are not only catching a buzz but they’re benefiting their bodies endocannabinoid system. Endocannabinoid deficiencies are a real thing and could potentially be one of the underlying factors of many of today’s problems. As more research into the endocannabinoid system is conducted and the efficiency and effectiveness of CBD become solidified the medical cannabis industry stands to surpass the recreational cannabis industry leaving it in a cloud of smoke. In an argument supporting the theory of recreational cannabis surpassing medical cannabis sales, BDS analytics released a report highlighting statistics from 2017. Colorado reported 1.55 billion dollars in revenue from Cannabis sales with $332 million coming from the medical market. California had $1.2 billion in cannabis sales with over half of that coming from the recreational cannabis market. Another statistic from the Brightfield Group predicts that the market for CBD might reach $22 billion dollars by 2022. This alone would surpass projections for the recreational cannabis market. When it comes to who will be the big winner between medical and recreational cannabis sales only time will tell. Many however argue that all cannabis sales and use is medicinal unfortunately governments segregate consumers based on medical diagnoses rather than the science of how this plant is meant to be consumed by our body to nourish one of the most important systems in our anatomy.